The mission of the Department of Oceanic Architecture and Engineering is to provide students with the best understanding of the marine and coastal environment to enable them to create architecture aimed at protecting both the natural environment as well as people’s quality of life. The Department is committed to cultivating capable engineers equipped with advanced knowledge of oceanic architecture, and to producing independent researchers who perform studies contemplating the effective utilization of oceanic spaces from diverse points of view. Students will acquire the skills and knowledge to construct and improve living environments while considering Japan’s geographic features. They will be able to manage safe construction and the completion of structures, infrastructures and disaster prevention facilities without compromising the protection and safety of the ecosystem. The Oceanic Architecture and Engineering program was established in 1978 with the objective of developing a comprehensive approach to engineering in response to the need for a new academic framework in the field. In the program, ocean and coastal zone are used as an integrated space to be developed. The curriculum is based on the basic knowledge acquired in undergraduate study and on new oceanic architecture theory, forming an interdisciplinary vision spanning architecture, environmental engineering, oceanic engineering, and social engineering/science. 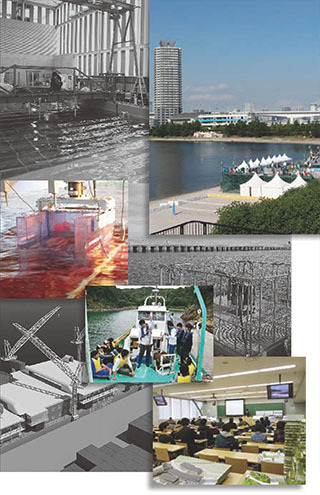 In the thirty years following its founding, the program has been involved in ocean development with national and local governments, planning waterfront developments, promoting overseas technical exchanges, and hosting international conferences. Graduate students complete their studies either with design work or a thesis, with many of their papers being presented not only in local, but also international conferences and scientific societies. Design works have won first prize awards for consecutive years in Design Awards for Students, a competition presented by Mainichi Shimbun, in addition to achieving high level results in other events. Upon completion of the course program, most students work for large construction companies, overseas-affiliated firms, educational research institutions, design offices, or engineering consultants. The faculty members of the program have additionally garnered high praise for their activities in society. In terms of experimental facilities, the Department provides the latest, most advanced equipment used to produce the highest quality research results.